Hey, everyone. The Eternity team is currently hard at work on the second part of The White March, but that doesn't mean we don't have time for updates and fixes for Pillars of Eternity and the first part of The White March! In this backer update we will share some of the fixes that have gone into 2.02, show off some cool swag, and let you know about some novels by a couple Obsidianites. In future updates we will discuss some of the things we are doing for the second part of The White March. Not only does Update 2.02 introduce some important fixes for the game, but we have even added in GOG Galaxy achievement support for you achievement hunters. The update is currently live on Steam and will be live on Origin and GOG within a day or two. Ambush Item Mod should only drain 15% attack speed now. Hey, where'd you get that shirt? As some of you saw in our last update, DRKN has produced some cool Pillars-inspired shirts and sweatshirts. Recently, Obsidian's order came in from DRKN and we had some fun posing for the camera. If you didn't get a chance to grab one last time there is still hope! Just head over there and grab yourself some of that Pillars swag. 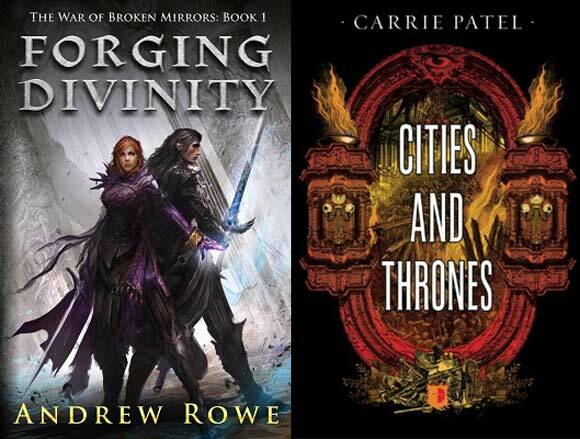 A while back we introduced you guys to some novels by Carrie Patel (Narrative Designer, Pillars of Eternity) and Andrew Rowe (Systems Designer, Armored Warfare). If you enjoyed those books we have some really good news, Carrie's second book in her Recoletta series is now available. Revolution transforms the city of Recoletta. The new leaders dethrone the old oligarchs, open up the secret archives, and establish a new government based on change and transparency. Months later, Recoletta is in shambles, the farming communes have revolted, and neighboring cities scheme against the crippled behemoth. Inspector Liesl Malone, now chief of police, must protect her city from black market barons, violent insurgents, and the excesses of her new government. Meanwhile, Jane Lin has fled to the city of Madina, where she learns of a plot to crush Recoletta. Jane must decide whether—and how—to save her old city from her new home. Cities and Thrones is the sequel to the critically acclaimed novel The Buried Life, and it's available in bookstores now. If you are interested in the series you can also find the first book here. If you didn't get a chance to pick up Andrew's book, Forging Divinity, the first time, now's your chance. If you are interested, head over to Amazon and pick up a copy. That's it for now. Look for our next update that will talk a bit more about The White March: Part II. Hey I switched over to non beta and nothing downloaded yet 2.02 is live...suppose to happen that way? If your beta build is up-to-date with the latest beta, then nothing will download. This is the correct procedure. It will only download something new if your beta didn't get updated to build 749 OR if you never downloaded any betas in the first place. I had the same thing happen to me. I had to uninstall Pillars of Eternity compeltely to opt out of the beta tier this time around; it was frozen in that state. I think you're under a misunderstanding. That's to say, you could not opt out of the beta. It was still listed as "Pillars of Eternity [Beta]" even when not in the beta. Any other time I've opted out, it will remove files and download new ones. (At least on Steam.) This time no files were downloaded and it froze me in beta (despite being listed as "none (opt out)" under the game's Properties. Edit: I'll grant you this isn't the beta bug report forum, but it's always good 'fax to keep people (who are trying to update that it won't happen the way they expect) well-informed so as not to look for their pitchforks. Edited by Thessaly, 28 September 2015 - 02:21 PM. Sweet. Thanks for the work guys! If you quit Steam and go back it will go back to normal after you opt out. I tried that before completely uninstalling, it didn't work. I even hard-booted my computer on the second attempt to verify and no luck. EDIT: Nevermind... looks like you tried this. Thanks for the info. I have seen this bug in Steam before, but I have never had to uninstall the game. Next time try switching your branch to the default branch and completely closing out of Steam. When you come back into Steam it usually fixes the branch problem. Steam can be a fickle beast when it comes to updating builds. Actually fixed a lot of the problems I had, not noticing anything broken. Nice work! But seriously... Chanters are trailer Trash skanks...fix them. Edited by Benedictous, 28 September 2015 - 07:23 PM. Does this mean they will no longer benefit from Weapon Focus talents? I suspect this means the exact opposite. I believe they are now treated like soulbound weapons and can benifit from any of the weapon focus talents. Like, a summoned quarterstaff would also get the accuracy bonus if you have only the ruffian talent. Hey Guys! Great work on patch 2.02 can't wait to try it out - unfortunately i have GOG version so i can't play it yet and it makes me wonder - if i started game two days ago - currently trying to beat Path of the Damned + Trial of Iron and in Expert Mode does GOG achievements work retrospectively? Can i still play it and implement the patch later on when it's live on GOG or in order to get the achievements i will actually have to start a new game? To be honest, I am not sure if they will work retroactively. I think some of them might (because he have added in some retroactive checks for some of our achievements), but others may not. Sometimes it works, sometimes it doesn't. You have to repeat the process until the darn client finally understands that you don't want beta. Seems to be a problem on their side. If there are two separate patches for WM and no-WM games will it be necessary to install both in order to patch the game properly? It's safe to assume there will always be two patches from now on. You only need the WM patch if you have the expansion. A bunch of people had to install both patches to update the game correctly. Most of the stories I've read is that installing both break the game. Installing only WM 2.01 gog patch broke it for me. From what I understood you do need both patches. What I did though is update it using Galaxy after I broke it. This time I'll probably just let Galaxy sort out the patches for me.